With large loading and unloading canopies, we can ensure that your products are never exposed to the elements. We have 24/7 security, CCTV and alarmed warehouses. Secure outside storage compounds are available. 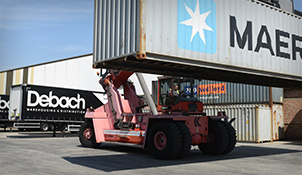 Fully loaded containers handled by our reach-stackers in secure environments. Devanning of containers (or trailers) by hand onto any type of pallet. Unloading of containers (or trailers) using specialised equipment such as slip-sheeters, container spec forklifts. Specialist forklift attachments such as reel clamps, carton clamps and long tines. Bulk handling and storage facilities as needed. 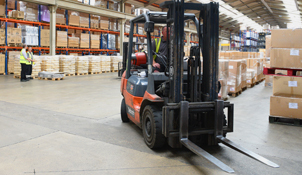 All our forklift trucks are electric or gas powered to keep the warehousing environment as dust-free and clean as possible. 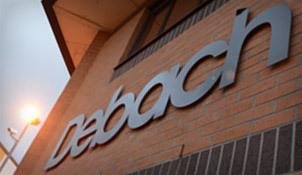 We recycle every piece of packaging we can and have fully radio-frequency wired warehouses for live stock information.